South Africa Celebrates 20 Years Of Democracy : The Two-Way President Jacob Zuma led Freedom Day celebrations in Pretoria Sunday, as South Africa marked the 20th anniversary of democratic rule. Back in 1994, voters sent Nelson Mandela to the presidency. 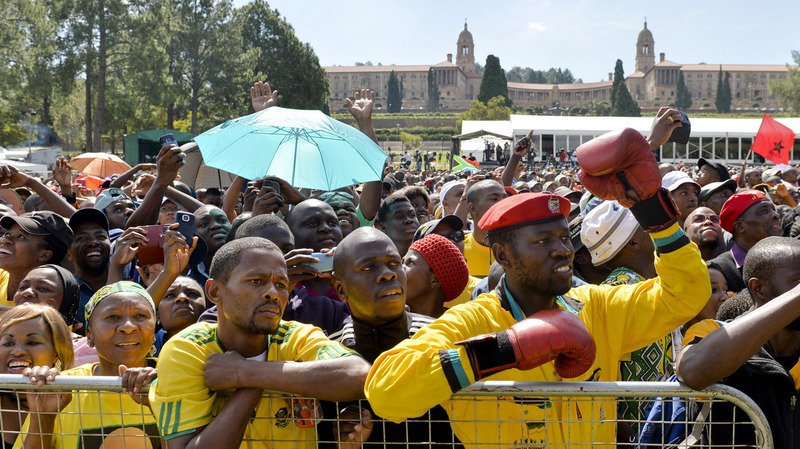 People attend South Africa's Freedom Day celebrations in Pretoria, with the federal Union Building in the background Sunday. The day marks the end of the apartheid era, when all races went to the polls to vote in historic 1994 elections. President Jacob Zuma led Freedom Day celebrations in Pretoria Sunday, as South Africa marked the 20th anniversary of democratic rule. The nation held its first general elections in 1994, when voters sent Nelson Mandela to the presidency with a resounding win that helped the country distance itself from the scourge of apartheid. The 1994 election concluded a lengthy transition process that began after decades of apartheid ended. Four years earlier, Mandela had been freed from prison. At the same time, political parties such as his African National Congress were released from a government ban. After the historic vote of April 27, 1994, Mandela went on to lead South Africa into a new era. The death of the inspirational leader last December sent the country into mourning. As it celebrates Freedom Day in 2014, South Africa is gripped by entrenched economic inequality that is fueling a contentious election season. Voters will head to the polls next month. "The precious right to vote was gained through relentless struggles and sacrifices. Therefore, on the 7th of May, let us go out in our millions to vote and celebrate our hard won freedom and democracy. Let us vote to consolidate democracy and all the achievements of our young nation. And, as we did in 1994 and in subsequent elections, let us deliver peaceful, free and fair elections." That's according to news channel SABC, which also noted that speakers from other political groups were booed off the stage at a Freedom Day celebration in Durban. The current state of affairs led Archbishop Desmond Tutu to say he is happy Mandela isn't around to see South Africa's struggles. "I'm glad that Madiba is dead. I'm glad that most of these people are no longer alive to see this," South Africa's News24 reports Tutu saying in a widely cited interview with the Sunday Times newspaper. Tutu added, "I didn't think there would be a disillusionment so soon." " 'It's nice to celebrate that we are here,' said Gundo Mmbi, a student at the University of the Witwatersrand in Johannesburg. But she said the 20th anniversary of democracy is also a time to reflect on the need for change in South Africa, citing 'really crazy' corruption and a lack of opportunity for the poor.
" 'It's not just about your color anymore,' she said. 'Discrimination has gone beyond.' "